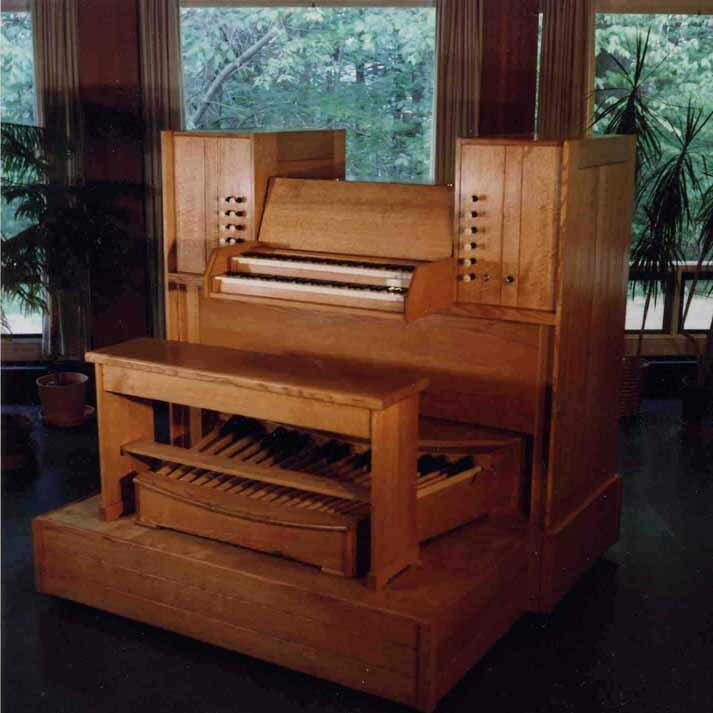 This studio organ built for Nancy C. Reed of Newfane, Vermont consists of five ranks of pipes. The action is electric which permits the tonal resources of the instrument to be creatively disposed over two manuals and pedal, thus providing a wide variety of color and versatility in such a small instrument. 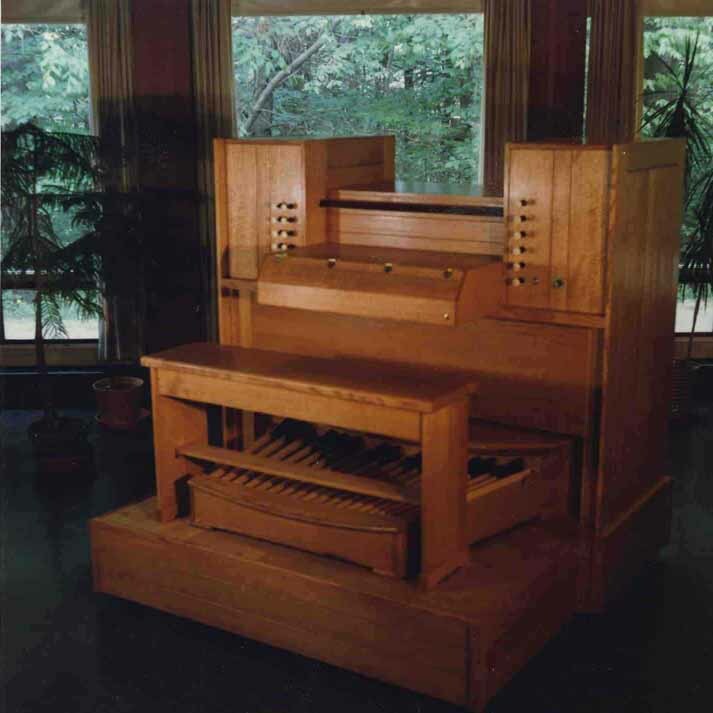 The instrument was designed so as to be suitable for small church, studio teaching, continuo and and orchestral use. It has been used in all of these venues over the past fifteen years. The instrument has provided music for Sunday worship at All Souls Church in Brattleboro, Vermont, as a continuo instrument with the Blanche Moyse Chorale, and has been used a number of times in performance with the New York Philharmonic Orchestra and the Westminster Choir under the direction of Kurt Masur at both Avery Fisher Hall at Lincoln Center, New York City, and the Cathedral of St. John the Divine, also in New York. The organist sits behind the pipes and may easily look over the instrument at the conductor. The entire instrument is self contained and occupies an area of six feet by six feet and has been fitted with casters so that it may be easily moved about. The base section separates, and the key desk can be tilted up, so that the instrument fits through a 36" wide doorway when required. The base area under the pedal keyboard houses the blower, wind regulator and a speaker for the bottom twelve notes of the 16' Subbass stop. 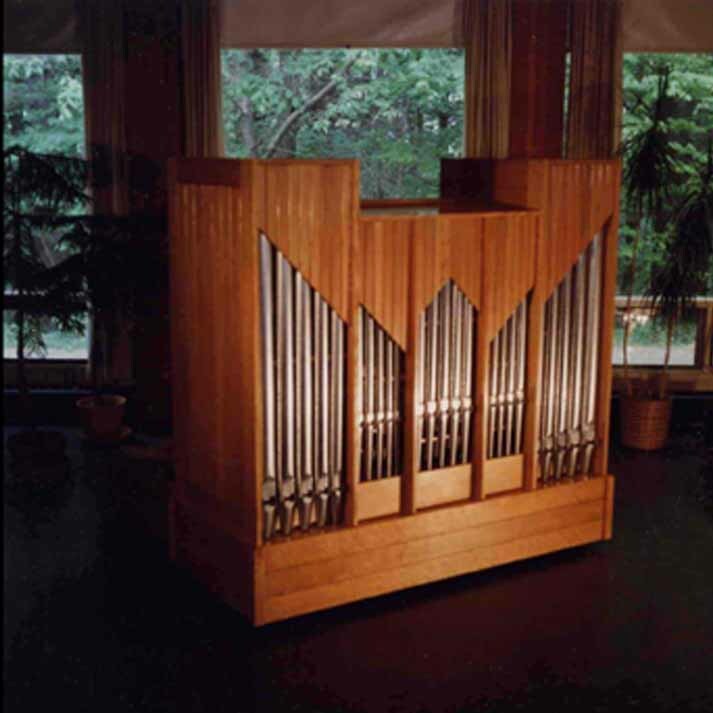 The organ's relay has been configured so that a winded Subbass pipes may be connected to the instrument instead of the electronically generated sound. Winded Subbass pipes were provided when the instrument was used in New York. The case is made of solid quarter sawn red oak in a simple contemporary style with v-groove planks housed in traditional frame joinery. The facade is made of spotted metal with scribed and pressed mouths. In addition to the locking keyboard cover which folds open to provide the music desk, locking, solid oak cover doors are also provided to cover the facade pipes when additional security is required.